So here I am, approximately four years later looking at redoing the hex map of the Stolen Lands. Armed with better mapping skills, software and experience, I'm taking another whack at this. 1) I'm mapping at 12 mi to the hex. That's the scale of the Kingmaker AP, so there's no reason to change that. I'll eventually map the surrounding areas at 12 mi / hex as well. Ideally, we'll have a small collection of maps before this is done useful for extended RPing in the River Kingdoms and beyond. 2) The locations of places in the AP supercede the locations of places on larger scale maps. Generally, I will follow the rule that more detail = better. So, if I have something mapped down to the square mile, it will be used over something mapped to every ten miles. 3) I'm going to orient the maps due north (in keeping with the Inner Sea World map. While I can orient it to the Kingmaker AP, I think that it will be better to have north point up. As such, I'll also put together a key to help people locate all the encounters in the respective AP issues. 4) I'll be using the Mystara-inspired tiles. Because I grew up with them, and because they are cool. That's about it. I've got the Stolen Lands overlain on the regional maps below, so you can get a general idea where everything is. Most things line up pretty well (1-2 miles off at worst) except for Restov. I can't make Restov fit without breaking everything else. Actually, I couldn't even make it fit then. So, in keeping with Rule 2, Restov is moved about 50 miles east of where it would appear on the regional map. The Kingmaker AP map overlain on the regional maps. 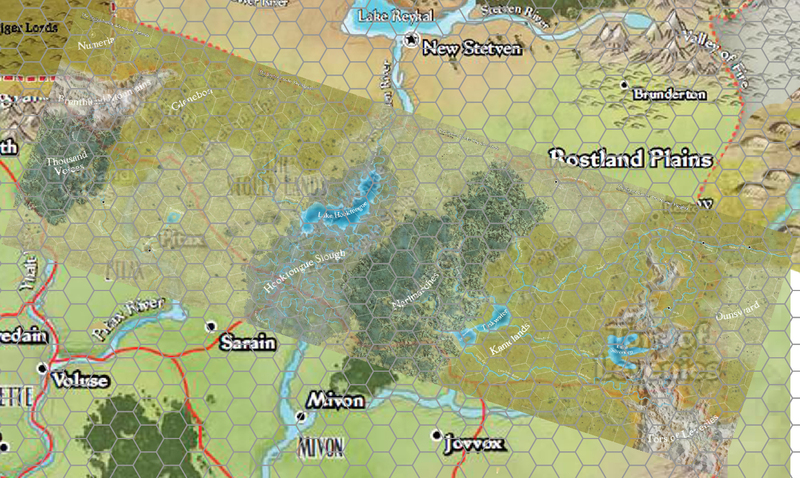 You can see both the Kingmaker hexes as well as the regional hexes. And yep, as many knew or suspected, Mivon sneaks into the bottom of the Kingmaker AP.